Karthik Sivakumar was born on May 25, 1977, better known by his stage name Karthi, is an Indian actor who works mainly in the Tamil film industry. Karthi was born in Madras (now Chennai) in Tamil Nadu, India. He completed his primary and secondary education at Padma Seshadri Bala Bhavan and at St. Bede Anglo-Indian Upper Secondary School in Chennai. He earned a Bachelor’s degree in Mechanical Engineering from Crescent Engineering College in Chennai. After graduating, he worked as an engineering consultant in Chennai and considered higher education abroad. “I earned about ₹ 5,000 per month and found the work was monotonous, and that’s when I thought I should do something more,” he said in an interview. Karthi obtained a scholarship for graduate studies in the United States and enrolled at Binghamton University in New York, where he earned a Master of Science degree in Industrial Engineering. While pursuing his studies, he also took elective courses on filmmaking. A younger brother of actor Suriya, Karthi holds a Bachelor’s degree in Mechanical Engineering from India and a Master’s degree in Industrial Engineering Science from the United States. However, he always wanted to become a director and returned to India where he joined Mani Ratnam as an assistant director. 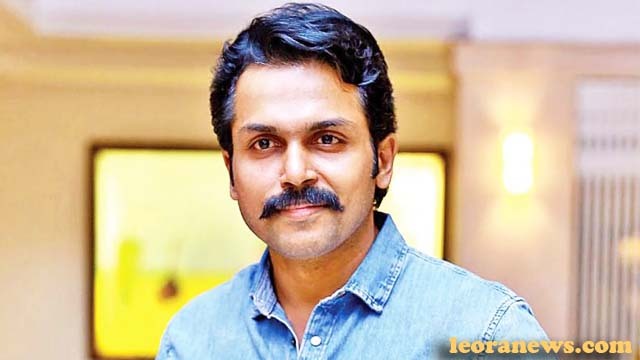 He was nominated for acting roles and made his debut in Paruthiveeran in 2007 as the main character, naughty villainous villain, earning rave reviews and receiving many accolades, including the Best Actor Filmfare Award and the Tamil Nadu State Film Award. .
Karthi is the second son of actor Sivakumar and his wife Lakshmi. He has two brothers and sisters; an older brother, Suriya, who was already an established actor at the time of Karthi’s film debut, and a younger sister named Brindha. Tamil film actress Jyothika is Karthi’s sister-in-law. On July 3, 2011, Karthi married Ranjani Chinnaswamy, who holds a Master’s degree in English Literature from Stella Maris College in Chennai. They were betrothed on April 29, 2011, in Ranjani hometown, Goundampalayam, Erode District, and the wedding took place at the CODISSIA Exhibition Center in Coimbatore. The wedding was arranged by the elders of the family. They have a daughter named Umayaal, born January 11, 2013.